A small (up to 510 mm or 20"in total length) light tan, cream or pinkish tan snake with more than 17 brown or gray-brown blotches on the body. Smaller brown or gray-brown blotches mark the sides. A dark line extends down from the eye to the upper lip. The snout is blunt and the head is barely distinct from the thick neck. The scale on the snout (rostral) is large, thick, triangular, and shield-like. The underside is plain pale gray or white. The scales are smooth and shiny and the pupils are elliptical. The similar Saddled Leaf-nosed Snake has fewer than 18 dorsal blotches. 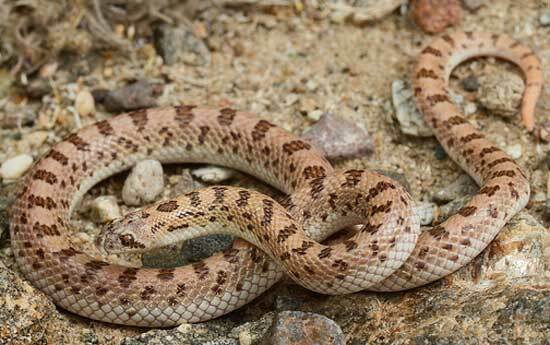 This snake is distributed across Arizona's western and southwestern deserts at elevations ranging from just above sea level along the states western border to approximately 4,000'. It inhabits Sonoran Desertscrub and Mohave Desertscrub communities. In some areas it enters the lower reaches of Semidesert Grassland. It is found in open creosotebush flats, rocky bajadas, washes, and large drainages within desert mountain ranges. It is a nocturnal ground dweller. It uses its enlarged rostral scale for burrowing and spends the majority of its time under the soil. It hibernates during the cold months of late fall and winter. It is commonly encountered on the surface at night in June. This dietary specialist feeds almost exclusively on the eggs of lizards and snakes. It might occasionally eat lizards. It lays a clutch of up to 6 eggs in summer. Hatchlings begin to emerge in July.